Animonda GranCarno Original Junior is tasty and healthy wet food for the first year of your young puppy's life. The wet food contains 100% pure and fresh meat, specifically tailored to meet the nutritional needs of your small rascal. GranCarno Original Junior, made by Animonda, is tasty and healthy wet food for your growing puppy. The food has been specifically tailored to meet your puppy's nutritional needs for the first year of his life. It contains 100% pure and fresh meat, without grains or soy. The meat has been cut into small, puppy-sized pieces, so your little rascal will be able to easily eat the food. Animonda, GranCarno Original Junior - Beef with chicken: 40% beef (lung, meat, heart, liver, kidneys, udders), 28% chicken (liver, meat, stomach, throat) and calcium carbonate and salmon oil (0.2%). Animonda, GranCarno Original Junior - Beef with turkey heart: 54% beef (meat, liver, lung, heart, kidneys, udders), 14% turkey hearts, calcium carbonate and salmon oil (0.2%). 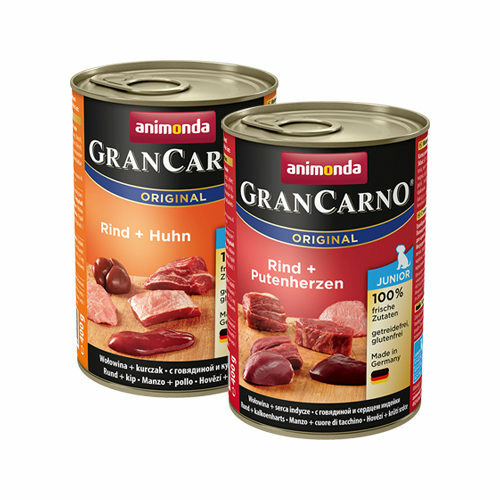 Have you used Animonda GranCarno Original Junior before? Let us know what you think about this product.